Recruiting the right physician for your hospital or medical practice can be a daunting job. You’re tasked with filling a big position that, if done right, can generate millions of dollars in revenue for your facility. If you’re not getting exceptional hires, it may be because your interview questions are not going deep enough. Of course, you have to be sure that your physician candidates have the necessary medical expertise and specific skills to do the job. Therefore, a thorough review of their academic record, residencies, board certifications, fellowships and past clinical experience are all essential to the screening process. But once you’ve qualified the applicant in those obvious areas, don’t stop there. If you ask typical interview questions, you’ll likely get rehearsed answers. Instead, look “under the hood” to find out how they solve real problems and what ideas they can bring to your medical facility. The best candidates often find standard interviews to be predictable and tedious, so design your questions to allow them to demonstrate their personality, ideas and leadership potential. Here, we offer eight open-ended and scenario-driven questions that are sure to stimulate top physician candidates and provide you with substantive and useful insights to inform your hiring decision. #1 Why are you making a job change now? Most physicians don’t change jobs without a reason. They make a change because they are unhappy in their current role or feel like something is missing. Ask the candidate why he or she is seeking a new position, and don’t be afraid to probe for details. This line of questioning can provide essential information to help you thoroughly evaluate the individual and may also reveal any red flags about their past performance, work ethic and interpersonal skills. #2 Can you describe your ideal work environment? If your hospital or medical practice has a culture that is working well — fostering efficiency, camaraderie and quality patient care — then it’s critical to maintain that environment. Conversely, if you’ve identified the need for improvements in patient care, teamwork or morale, then bringing fresh perspectives into the facility can be the beginning of positive change. Consider this when you ask the interviewee to describe his or her ideal work environment. Does the physician enjoy a team atmosphere or prefer to work as an individual contributor? What is their idea of a perfect day at work? Are they seeking a fast-paced or relaxed setting? A physician who lands in their ideal work environment is more likely to stay long-term and become a valuable contributor to your practice. #3 Name three undesirable aspects of your previous position(s)? Just as important as understanding a candidate’s likes is understanding their dislikes. In their previous role, were there specific job requirements the physician did not enjoy? Did he or she have issues interacting with coworkers? Was the culture not a good fit? Learning more about their past positions and what they found to be unappealing will give you valuable information and help you set expectations for both parties if you ultimately choose to hire this candidate. #4 Describe a conflict you’ve had with a fellow doctor or staff member and how you resolved it. Cultivating an attitude of cooperation and mutual respect among team members is the foundation of an excellent work setting. You may already have a staff that works well together, and you don’t want to add someone into the mix who will create issues. Therefore, learning about a candidate’s conflict management skills is extremely important. Ask the candidate to explain in detail how they’ve dealt with disagreements in the past. Listen for how they manage issues that arise among team members, how they handle complaints from patients, what they do to foster healthy working relationships and how they raise objections in a professional manner. If the interviewee gives an example of a minor disagreement, offers generic answers, appears to avoid conflict altogether or seems uncomfortable with the question, these may be signs that he or she has trouble communicating effectively and resolving conflicts. #5 Describe a time when you saw the potential for improvement in your workplace or a system that could be more efficient. What did you do to inspire change? This question will give insight into the candidate’s vision, leadership skills and self-motivation. The answers will help you understand if they are seeking to grow professionally and improve their work environment or if they are comfortable maintaining the status quo. #6 What unique characteristics or benefits do you offer? You likely already know the required medical skills of the doctor you want to hire, but there’s more to an applicant than what you can see on paper. Go deeper by asking the candidate to elaborate on what sets her or him apart from someone with the same set of skills. This open-ended question explores their broader strengths and capabilities, giving you more information about their personality and what they could bring to the practice apart from performing the obvious job duties. #7 With the current changes in the healthcare industry, what do you consider to be the most significant challenges and opportunities for medical facilities like ours? 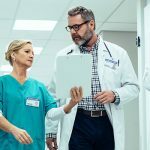 Medical providers and consumers alike are well aware that healthcare is a moving target, with a multitude of factors influencing the success of medical practices and hospitals. Chances are your facility is focused on multiple initiatives — quality of care, technology implementation, regulatory compliance, insurance contract negotiations, and the list goes on. If your new physician is coming on board in a leadership role or you expect them to take on greater responsibilities in the future, now is the time to explore their vision and evaluate their leadership potential. Ask them what they see as the three greatest challenges or threats affecting their field in the next few years. Follow that with a question about how they propose to manage these concerns and turn them into opportunities. #8 What questions do you have for me? This question may seem like an obvious one, but you can learn more about the individual from the questions he or she asks, versus the questions you ask them. Never forget this important final question. Hiring a new doctor for your medical facility is a major undertaking. At TinkBird Healthcare Staffing, we strive to make the hiring process seamless and easy. We can help your facility design an attractive compensation package and provide you with outstanding candidates who meet your requirements. Our professional medical recruiters will conduct a comprehensive search from our large network of medical providers; then we’ll do the initial interviews to narrow down the pool. Courtney Driver is CEO of TinkBird Healthcare Staffing, a boutique medical staffing agency focused on permanent and temporary placement of primary care physicians, physician assistants, and nurse practitioners.